Forest rangers these days are often too busy to ticket backcountry violators. An 8-hour ski trip delivers a challenge and a rare look at High Peaks beauty. Where’s the harm in skipping school for a snowshoe hike without weekend crowds? 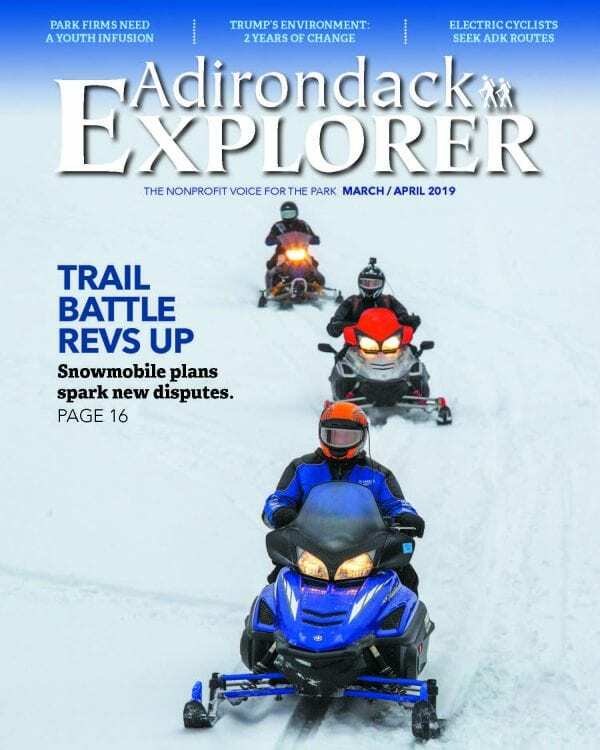 Snowmobile trails run into legal opposition as state seeks community links. It can pay to add a mobile phone to your backpack. Just don’t count on it without a backup. E-cyclists seek a place to ride, but for now it’s illegal on park trails and roads. Paul Smith’s College Visitor Interpretive Center has big plans for its cross-country trails. It can be challenging to stay in the loop when Adirondack officials consider your pet issues. As the Adirondacks face a wave of business retirements, who’s up next? Mud season approaches, and with it the need to choose dry trails that won’t erode. It just takes a few bucks and some courage to test out skis that speed winter outings. As mange spreads through Northeast, some park bears suffer and even starve to death.